So this is where missing remote controls go – not down the side of the sofa, the Amazon. Calling it. The city is hidden by fronds. Published by “Moody Teen Books”? This tale is guaranteed to brighten their day. With the size of the vehicle, why did they cram everyone into a tiny cockpit? @Bibliomancer—Somehow the combination of “Moody Teen” and a Prussian Iron Cross doesn’t inspire feelings of calm reflection and a brightening day. For some reason as I look at this cover I keep thinking it’s a Twilight Zone episode and any second a giant alien hand is going to reach down, pick up that thing, and start using it as an electric razor. @B.C. – I’ve seen that one! I think it’s called “To Shave Man”. Tom Swift and his Amazing Amphibo-Car? @Bibliomancer: a hairy tale no doubt. @JuanPaul: there also appears to be a lack of doors. Getting in and out must be a bit of a pain. The ant-hill mob have stolen the Batmobile and driven into a river. Ten comments in and nobody’s managed to make a Jeff Bezos/ tax-evasion gag that matches the picture. Hardly surprising: that’s not a river, or a waterfall, it’s a lake that runs right up to the edge of a cliff but somehow never overspills. Is it actually water or some blue jelly? 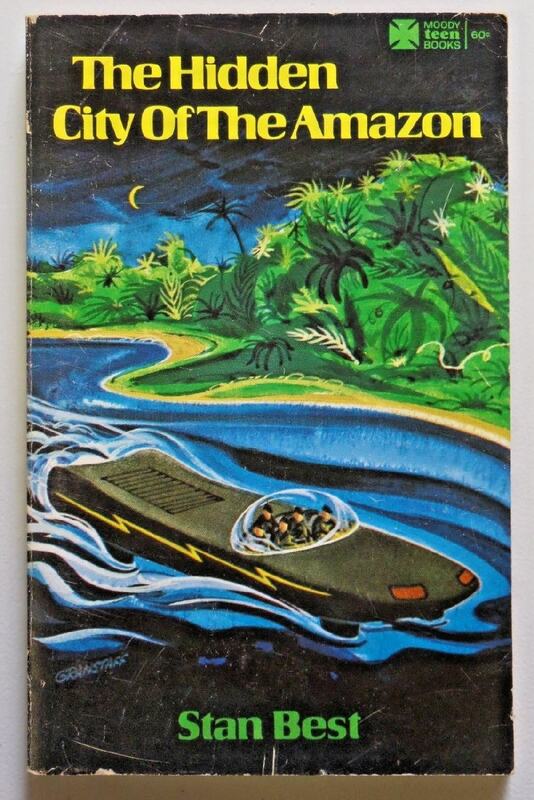 @Tor M—The French version of that film is titled Zee Lost City of Zed. The city isn’t hidden, it’s been left with your neighbour. If that is an air breathing engine underneath those ventilation louvers I think they’ll have a good case against the manufacturer when they sink. A stern wheeler? @ 12, 13. Not ‘The Lost City of Z’, but the classic 1984 computer game ‘7 Cities of Gold’. @BC: Moody Hitler Youth sound like not a good time indeed. But didn’t they take their natty uniforms and super-science to build hidden cities in South America? You may be onto something! I had been thinking the size was possibly due to anti-radiation shielding, which makes Bruce also correct with his T. Swift reference. You’re both sort of right. It’s actually “Tom Swift and his Triphibian Atomicar”. Remember? It was already here…. @Hammy: GSS! I couldn’t remember the title, but knew we’d seen it here before. And I’d forgotten it was “triphibian”, which I presume includes water and land travel. @Bruce: I guess this one pops the bubble open so all the Hitler Youth have to scramble over each other to squeeze into it. Guy in back has a black uniform to the others’ olive drab, so I guess he’s in charge. Sitting in the back so he can keep an eye on all those moody teens. @GSSxn( #prev. ): Indeed, triphibian in Tom Swift context means air, land and water travel. Of course it does…. @BAMunro(#23): Your guess is as good as mine. I just hope there’s no escape hatch on the lower surfaces. Oh, I might point out – you can tell that the Triphibian Atomicar is of American manufacturer and the one on this cover isn’t because, in true ‘murcun fashion, the Atomicar is loaded with chrome…. @Hammy: so the furriners ripped off Tom’s good old American know-how, and made it darker colored, no chrome, and a smaller passenger interior. Typical. At least they got the lightning bolt, though that might be an SS reference. Are the wheels down as this thing’s gliding along in the water/jelly? That seems like not a good idea. 007’s amphibicar retracted the wheels AND it was stylish with a much smaller engine compartment. Am not ruling out that this is some dessert gone wrong, with a toy car plunked into either Jello or that shiny cake frosting, and some artificial greenery.